The only child of Lord Selwyn of Tarth, Brienne was never like other women—very tall and ungaily as a girl, and with a very plain appearance marked by a broad, coarse face with many freckles, crooked teeth, and more. Her father let her train at arms, due to her size (some 6’6” feet) and strength. When Lord Renly called his supporters to him at Highgarden, Lord Selwyn sends Brienne with the Tarth contingent. A skill warrior, her armor is enamelled blue, one of the colors of Tarth which is known as the Sapphire Isle for the blue of its waters. 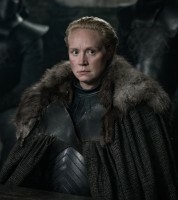 The actress cast in the role is older than Brienne in the novel, and certainly much more beautiful to look at—it will be interesting to see what makeup does with her appearance. 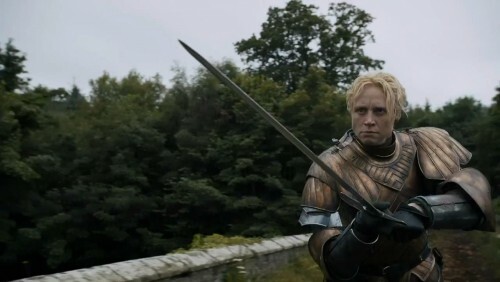 She is also certainly nothing like so broad and muscular as Brienne is described.